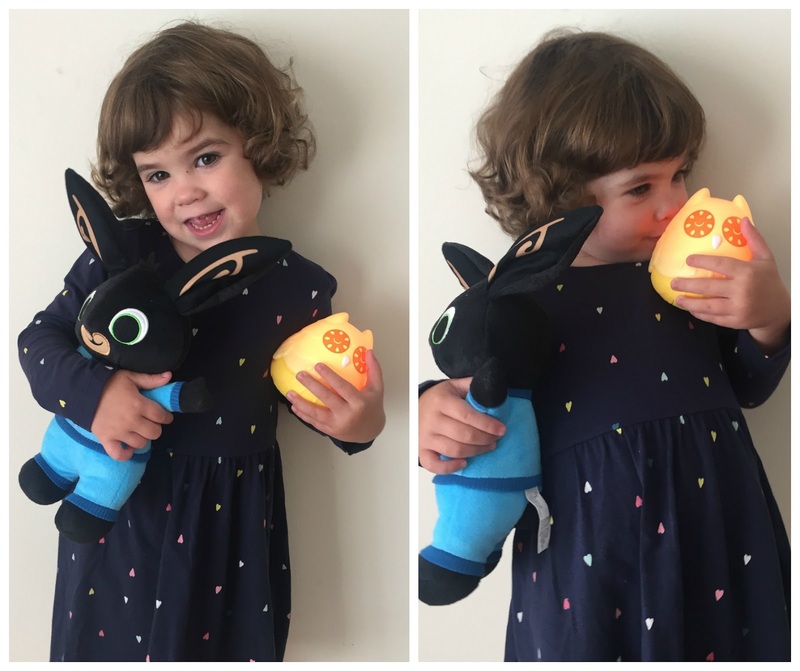 there was no hesitation from myself and my little Bingster and when Bedtime Bing finally arrived Molly-May was in awe of it and couldn’t wait to open it! after we just arrived back from our family holiday! 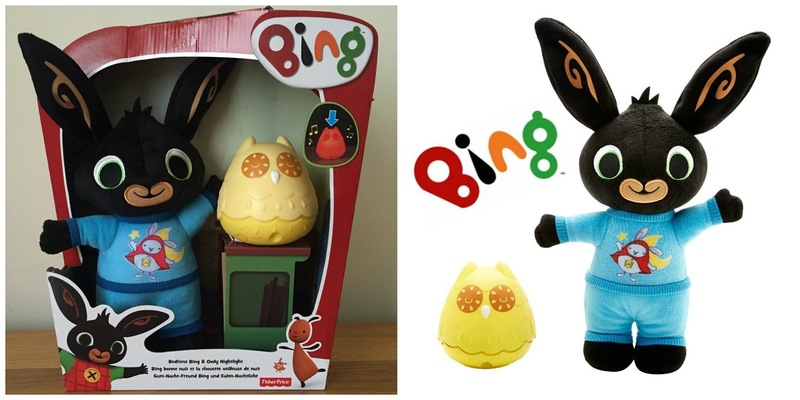 If your child is a fan of the huge Cbeebies Emmy award wining show “Bing” which has been on Telly since 2014 you probably already noticed that Owly looks just like Bing’s nightlight in his bedroom! Lights and Sounds, Lights only, or Sounds only. Its suitable from 2years+. for your little one to fall asleep! I was trying and failing miserably to capture the different colour changes when the night light is on it basically goes from a light soft yellow to a orange and then onto a red colour. We have been using Owly in just the Light&Sound mode because Molly-May loves to hear the “Bing Bong” song for bedtime (yes, that is from another show entirely but she decide to name it that). The 15 minutes of changing lights and soothing music is just the right amount of time for me to sit with her whilst she is drifting off to sleep and we have a little agreement when the music stops and she is still awake Mummy is leaving the bedroom but she can have another round. She is pretty pleased with that although 50% of the time she will be snoozing away before the music stops anyway! At first i thought the music was rather on the loud side for a lullaby but because her brother might be still up and going up or down the stairs or Daddy is preparing to head out for his Night shift i quite like it that way now so the outside sounds are muffled thanks to the music coming from Owly. And we also have Owly a little bit further away from her bed so it isn’t right near her ear anyway. But i have to state that towards the end of the 15minutes the music does go quieter! 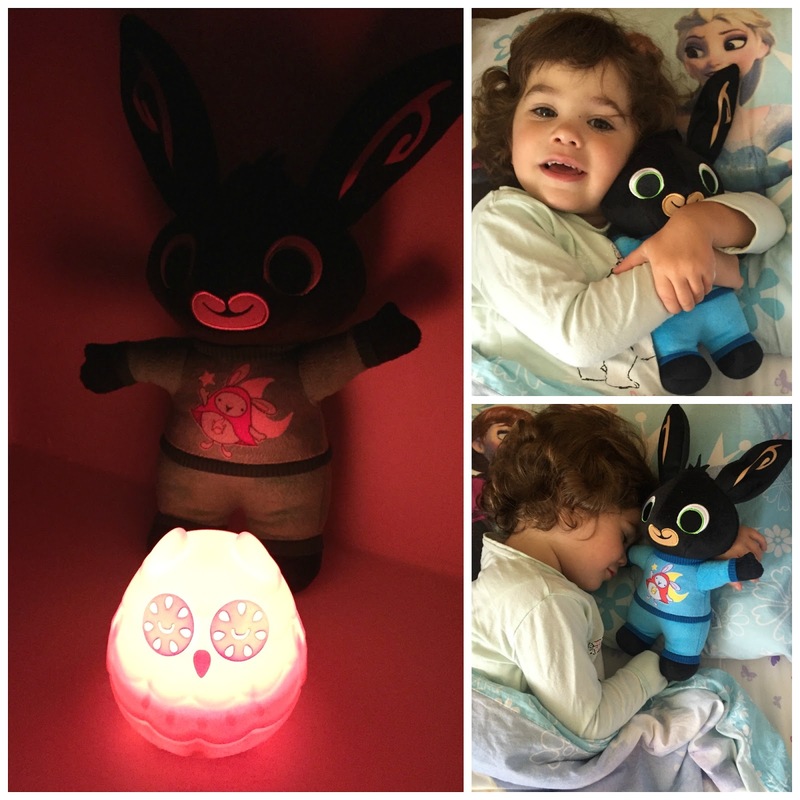 The nightlight is sturdy and turning it on is simple with a little push down the Owly’s head which is easy enough for little hands to do themselves. I think its a fantastic nightlight & cuddly toy set and i can see Molly-May loving it for a long time to come! The only thing i would improve is a level button for the music but other then that it would make a great present for any little Big Fan! Just like all the other Fisher Price Toys we have and had in the past this one is coming with the required Batteries (3x AAA) so no rushing to the shops with this one! This Bing & Owly Night Light Set will make the perfect Christmas Present for any little Bingster and you can get your Bedtime Bing for you just £27.99 from your local Smyths Toy Superstore. Disclaimer: I have been sent the Bedtime Bing & Owly Nightlight for reviewing purposes, but all thoughts and opinions are mine.